I rarely bake low-fat things. If I haven't already told you, my motto is, if it doesn't taste good, why make it? But, in this case, I relented. 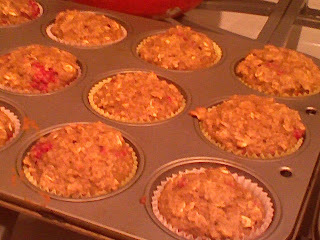 When I found this recipe for Low-Fat Oatmeal Muffins, I thought I would for once give it a shot. Applesauce, oats, whole wheat flour, fresh berries - healthy right? And since it came from Joy the Baker I thought it had to be good. 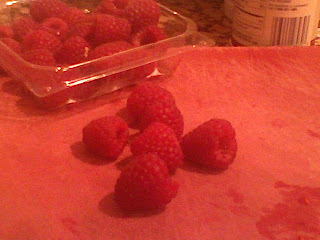 The original recipe called for fresh blueberries, but since I've never been a big fan of those I figured I'd go with raspberries instead. Well, I'll be honest with you - they were...okay. Not great. Not awful, just okay. There were a few specific problems I had that could potentially be corrected. Firstly, the raspberries I used weren't very sweet, they were actually quite tart, and so biting into one in the cakey muffin was sometimes an unwelcome surprise. For me anyway. Also, the fresh berries made the muffin surrounding the berry a little wet, not overwhelmingly so, but noticeably so. And I have to admit, I made a perhaps questionable substitution. As I was measuring out my oats, I realized I was about 1/4 cup short of the 1 1/4 cups the recipe called for. I searched around my kitchen, looking for anything that might work - and then I found some plain shredded wheat in the cereal section. Crushed some of that up, poured it in - and tada! Don't know if I would recommend that in the future, but I can't really say if it affected the recipe at all. And, well, finally - they tasted low fat. I also felt the dough itself was a little bland - maybe increasing the brown sugar and the cinnamon just a touch would help. Then again, that's just me. I don't want to discourage any of you from baking low-fat, there are great recipes out there - and I know alot of you have had success with splenda replacements for sugar and brown sugar alike. So, go forth and bake! And then tell me about it please! Tip of the Day: Substituting applesauce in baked goods works best in oil based recipes, not those with butter. If you're trying it, substitute the applesauce for oil 1 to 1, and then add 2 tbsp oil in addition. Good Luck! Combine the flour, oats, baking powder, baking soda, salt and cinnamon in a bowl. In a separate bowl, combined the applesauce, buttermilk, sugar, oil and egg. Divide the batter in to 12 greased or paper-lined muffin cups. Bake at 375 F for 16-18 minutes. I don't know how I stumbled across your blog, but I'm glad I did. And I can completely relate to the anti-low fat baking thing. I always laugh that my life motto is "i'd rather be fat and happy than skinny and sad."